Thousands of protesters packed Madrid today in a fierce backlash against Spanish Prime Minister Pedro Sanchez and his planned talks with Catalan separatists. 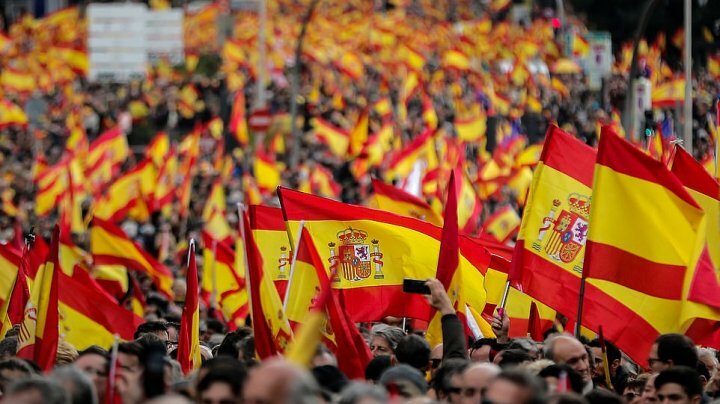 Demonstrators waving Spanish flags filled the Plaza de Colon in the city centre in the largest protest Sanchez has faced since taking office last year. Recent polls have shown the conservative Popular Party, center-right Ciudadanos and far-right Vox could together win a majority of seats in parliament if elections were held, allowing them to replace the Socialist government. 'The time of Sanchez's government has ended,' Popular Party leader Pablo Casado told reporters before the protest. Ana Puente, a 73 year-old retiree who attended the gathering, said she was protesting for a 'united Spain'. 'The government is giving many things to supporters of Catalan independence and is going to break Spain apart,' said Raquel Garcia, 76, who was carrying a Spanish flag. The protest took place two days before the start of the trial of 12 Catalan independence leaders, who face up to 25 years in prison for their role in 2017's failed secession bid from Spain. A referendum in October that year was declared invalid by Madrid and separatist leader Carles Puigdemont fled into exile in Brussels. The government faces a key vote on Wednesday on its 2019 budget proposal, which will likely fail without the support of Catalan parties.